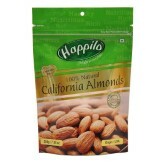 Amazon India offering Happilo Premium 100% Natural Californian Almonds, 200g (Pack of 5)( Free Rs. 400/- Bookmyshow voucher ) Rs. 1031 Rs which is worth for Rs 1375 at best and lowest price online. Free Shipping for Prime users or avoid make cart value 599 OR Free Shipping for Prime Users. Activate your prime account.You can follow the below steps to buy this product at their deal price.Keep Visiting dealsheaven.in for more Best offers ,hot online deals, promo code, coupons and discount . Temp code will be valid from 1st September 2017 to 30th June 2018. Voucher to be valid for 1 month from the generation of the Promo Code. Tickets can only be booked on BookMyShow website and app for movies for all shows from Monday to Thursday only. Voucher will only be adjusted against the ticket cost. Convenience fees any additional charges to be borne by the voucher user. Voucher can be used only once within the validity period and multiple vouchers cannot be clubbed in a single transaction. Vouchers work on non-extension clause and the ticket/s, once booked (voucher redeemed), cannot be Cancelled or Refunded. Vouchers cannot be redeemed directly at the Cinema/Venue Box Office. Not more than 7 vouchers to be claimed by a single customer using the same mobile number and email id. Minimum 2 tickets to be booked in a single transaction. How to Buy Happilo Premium 100% Natural Californian Almonds, 200g (Pack of 5) ?